Bespoke Post Review 2018: The Best Subscription Box For Men! One of the most fun companies offering subscription boxes for men today is Bespoke Post. 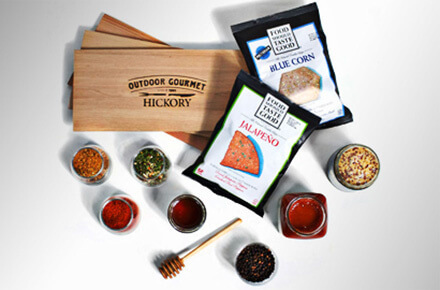 Bespoke is a US-based company that provides cleverly themed boxes filled with classy, small-batch, remarkable products. Each month, Bespoke Post will send you a box containing collections of items ranging from grooming goods and fashion accessories, to snacks, camping gear, and even cigars. If you're not sold on the theme, Bespoke Post lets you easily switch to another box, or skip the month's subscription box entirely. These boxes and their contents are remarkably high quality and it's difficult to overestimate the fun you (or whomever you're gifting it to) will get from opening them. Creative Curation of Classics - Each box contains a cleverly themed collection of men’s grooming and lifestyle items from unique, up-and-coming and small-batch brands. Not Just a Box Subscription Service - Bespoke Post is a full-fledged online store carrying over 350 brands relevant to its demographic. Bespoke Post Club Perks - With a subscription, purchases from their online store during the first five days of each month are bundled in with your scheduled box; which means no separate shipping fee. Limited edition boxes are also $10 cheaper for you. Refund and Return Policy - Bespoke Post accepts returns for all boxes within 60 days of an order. Then can exchange it for store credit (minus shipping cost), or refund to your credit card (minus a $6 fee). You have to return the entire box in mint condition, though. No Subscription Options - Bespoke Post does not offer long term subscriptions with a discount; just month to month. Limited Box Customization Options - Boxes cannot be customized. However, you can see the contents of each box before shipping; if you don't like what you see, you can either switch it with a previous box or skip a box for the month--both at no added cost. Limited International Shipping - Bespoke Post ships boxes to the US and Canada, as well as US military addresses--although you will have to email them specifically to set it up. Limited Referral and Rewards - The rewards program only benefits you if you use it; no perks to the referred party, as is usually the case. You earn $25 credit (which can only be used for box orders) for every successful referral. Bespoke Post is a company that’s built around the idea of providing product and brand discovery to a male demographic that doesn’t enjoy shopping and browsing aimlessly, but still wants to learn about and have the best of what’s available in the market. Their online store is well organized, and filled with fresh and unique products from brands worldwide, from classic lifestyle pieces to utilitarian tools and more. It’s also coupled with content and layout choices meant to help you shop smart and shop quick: subsections by brand, category, popularity and price; suggestions and guides; and even a whole page detailing gifting options and easy to follow instructions. The monthly Bespoke Post Box of Awesome subscription is a reflection and a distillation of the company’s original aim. You can sample the best of what they have to offer, month after month–all set up with a brief three-step process. Join the Bespoke Post Club by signing up and completing your profile (personal and billing information; plus a short questionnaire detailing your grooming, entertaining, and other lifestyle preferences and habits). Preview your Box of Awesome before it ships. Bespoke Post will recommend and show you the first box you’ll receive right away (future ones will be shows to you every first of the month). Previews will contain detailed photos, background information, and tips and tricks. Decide if you want the box or not before the 5th of the month. If you do, just sit back and relax while waiting for it to be delivered. If not, you can always choose to either switch it with a previous box that’s still in stock, or skip receiving the box for the current month. It’s worth mentioning that you can buy a Box of Awesome without subscribing, but it will cost you $10 more. Also, you can purchase from Bespoke Post’s online store every first five days of the month and have the items be bundled with your Box of Awesome; that way, you don’t have to pay a separate shipping fee for your store purchases. Add-on item suggestions that go with the current theme are presented for your consideration each month for this purpose. The box will arrive at your doorstep within the month. If you change your mind, you can return and exchange the complete box for credit or refund within 60 days. Each month Bespoke Post curates a small collection of limited edition and unique items to be put into your Box of Awesome, built around a particular theme. The chances of you getting similar items in a row are slim to none, because of the thoughtful way the complementary products are presented; and also because Bespoke Post strives each month to introduce you to a new way of thinking or doing things that may seem ordinary otherwise. For example: you may like drinking, but maybe you’ve never thought to put together an aged cocktail kit; or maybe you shave regularly, but have never bothered to try double-edge safety razors or alum blocks. The month on month subscription fee is $45; which give you great value, as each Box of Awesome is guaranteed to be worth over $70. Bespoke Post makes large buys with small brands in order to pass the savings they get from bulk orders on to you. Bespoke Post offers quality customer support. They have an extensive FAQ section to help address common requests and questions about their products and services. Aside from that, they also offer a hotline number and email support for addressing more complicated concerns. That said, live chat could have been a helpful addition to their customer support lines as those who are shopping on the website would have an easy way of getting in touch with support. After all, their focus is to make shopping as painless as possible for people don’t really enjoy spending a lot of time doing it. What's the Verdict on Bespoke Post? If you are looking for new products to experience and to improve your day-to-day activities, then Bespoke Post is definitely the way to go. They offer amazing items each month for only $45 to members and $55 to single purchases. More than that, each box contains items worth $70 each, making each one a bargain. You can also refer your friends and get $25 for each successful one so you can get a discount on each month’s subscription. You are not limited to purchasing only one box a month and you can even skip months when you don’t feel like purchasing any, or even swap current month boxes with previous ones. Bespoke Post’s no muss, no fuss approach is commendable and definitely something that will encourage people to stick around.